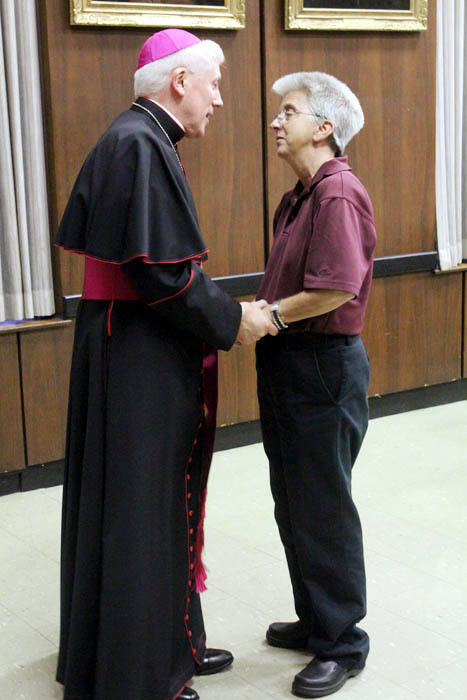 Bishop Thomas says goodbye to Denise Antonini of Our Lady of the Assumption Parish in Strafford, where he served as pastor until his ordination as bishop in 2006. 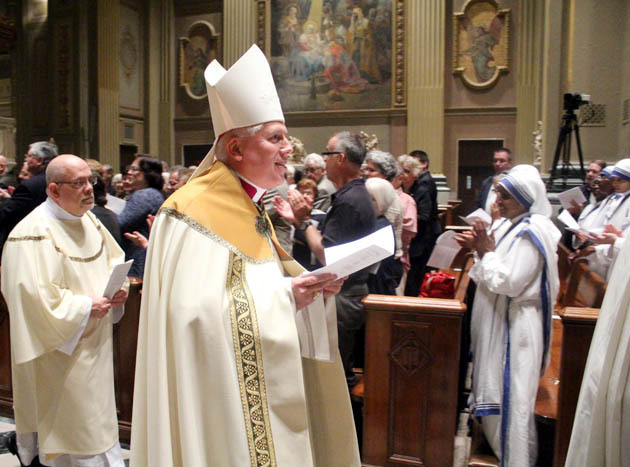 Bishop Daniel Thomas isn’t scheduled to take up his new duties as Bishop of Toledo, Ohio, until Oct. 22, but the Philadelphia faithful were given an opportunity officially to wish him farewell at an Oct. 1 evening prayer and benediction liturgy at the Cathedral Basilica of SS. Peter and Paul and a reception that followed at the Archdiocesan Pastoral Center. Archbishop Charles Chaput, who presided at the liturgy, recalled how well he knew Bishop Thomas long before coming to Philadelphia during his own days as Bishop of Rapid City and Archbishop of Denver when then-Msgr. Thomas was an official with the Congregation of Bishops at the Vatican, 1990-2005. “In some ways he was the face of the church in Rome when people like me would visit the Holy See,” Archbishop Chaput said. “There was that smiling young man with the white hair who looked more like a bishop than the rest of us. There he was with his great smile to welcome us to Rome. Donna Farrell, the executive director of the 2015 World Meeting of Families, is a former director of the archdiocesan Office for Communications, for which Bishop Thomas had oversight. After returning to Philadelphia from Rome in 2005 Msgr. Thomas served as pastor of Our Lady of Assumption Parish in Strafford until he was named auxiliary bishop the following year. “With his warm smile and loving heart, Bishop Thomas embraced our beloved parish,” said Joanne Bouvier, Assumption’s parish secretary. “He came to us with great compassion as if he had been a long-lost family member. Although only at Our Lady of the Assumption for eight brief months Bishop Thomas, a first-time pastor, quickly assessed the spiritual and temporal needs of our community and our individual families. His actions allayed the fears we had of losing two pastors within days of each other. Among his other duties Bishop Thomas had oversight over The Catholic Standard and Times and its online successor, CatholicPhilly.com. Matt Gambino, director and general manager for CatholicPhilly, said, “I’ve worked for a lot of bosses and he’s the best boss I ever had. He is a great listener, a leader and a co-worker. He is not afraid to roll up his sleeves and work at the task that has to be done. View photos from the evening.